Mezzo‐soprano Sarah Nordin is building an enviable reputation as an artist of brilliant technique and artistry, both as a singer and as an actress. Her ‘luscious’ voice has been praised by Opera News, as has her ability to “hold her own with the big guns” as Lola CAVALLERIA RUSTICANA with Orlando Opera. Ms. Nordin’s warm, rich voice easily fills the largest opera and concert venues and she has received critical praise for her skills as a comedienne in numerous roles including Orlofsky DIE FLEDERMAUS and Isabella L’ITALIANA IN ALGERI. 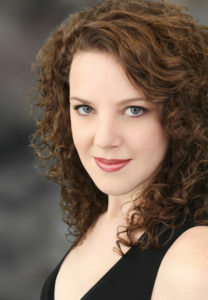 Recent Mozart roles include Dorabella COSI FAN TUTTE with Opera Tampa, Winter Opera of St Louis and Florida Opera Theatre, and Cherubino LE NOZZE DI FIGARO with both Opera del West and Long Island Opera, with the St. Louis Post enthusing that Ms. Nordin brought to the role of Dorabella “a rich mezzo‐soprano that fit Mozart’s music like a glove.” This 2017/18 season Ms. Nordin has joined both Opera Orlando and Geneva Light Opera to sing Zerlina DON GIOVANNI, title-role CARMEN in concert with Gulfshore opera, Dama MACBETH with Opera Tampa and Orlofsky DIE FLEDERMAUS with Opera Tampa. Other roles include the title‐role CARMEN in concert with the Livingston Symphony Orchestra, Flora LA TRAVIATA with Opera Tampa, Tisbe LA CENERENTOLA and Third Lady DIE ZAUBERFLÖTE with Salt Marsh Opera, Angelina (cover) LA CENERENTOLA for Orlando Opera, Zita GIANNI SCHICCHI and Marcellina LE NOZZE DI FIGARO with Hubbard Hall Opera Theatre, Isabella L’ITALIANA IN ALGERI, Meg FALSTAFF with Taconic Opera, and Prince Orlofsky DIE FLEDERMAUS with Geneva Light Opera and St. Petersburg Opera. Sarah has worked with many of the most prestigious companies in the US including Opera Theatre of Saint Louis, Central City Opera, Caramoor Opera and Opera North. Ms. Nordin has worked on the Metropolitan Opera’s productions of LES TROYENS, PARSIFAL, OTELLO, BORIS GODUNOV, NABUCCO and TURANDOT. She has been involved in three HD live broadcasts from the Met and joined them for their Japan tour in 2012. She has also travelled extensively throughout Europe and the United States as a soloist with the American Spiritual Ensemble. Ms. Nordin earned her Master of Music degree from the University of Tennessee and her Bachelor of Music degree from Lee University. She is also an accomplished French horn player and an award winning ballroom dancer.